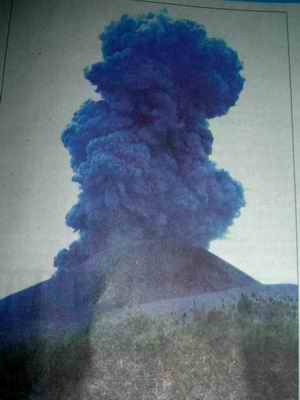 A few days ago, on SundayÂ August 24, there was eruption of the volcano of Mount Krakatau which is the second generation of the famous Mount Krakatau which erupted in 1883 and its explosion materials especially ashes can be seen around the world at that time. Sunda strait lies between Java and Sumatra island, western part of Indonesia. The mountain soaring high to the sky, from the strait of Sunda..
Fortunately there was not a big tide or tsunami happened, no victims reported.Â People from the ship or ferry acrossing the Sunda strait could easily saw the extraordinary event that happening.